As we speak, thousands of people are waking up in a smelly tent in a Somerset field. They’ll wander down to the mobile loos, consider eating some form of breakfast and then head straight to a stage or tent to commence the drinking all over again. Our passion for music will never change but our interactive experiences at festivals will. In celebration of Glastonbury Festival’s 40th anniversary, Orange has commissioned trend forecasters The Future Laboratory to investigate what the future may hold for festivals across the next 40 years. Here we take a look. Advances in retinal technology mean live sets will be interactive smorgasbords of changing lights, colour and visual effects. Contact lenses will allow us to add information or art to what we see on stage: ‘It’s the world around you with your own special effects,’ says Tom Savigar, strategy and insight director of The Future Laboratory. Similar technology is currently being tested for the partially blind, while contact lenses that receive information are under development for pilots. These lenses will be similar to today’s augmented reality where we superimpose virtual reality on top of the real world. ‘The personalisation of what’s in front of you is key in 2050, so layered on top of real content will be anything the user fancies. The producers of the show can set a number of options, so each performance can be tailored to your requirements.’ This could mean changing the colour of the stage or even adding a holographic of yourself dancing with your favourite band. While most of us embrace the idea of no contact with the outside world for five days, for others a dead mobile phone battery can be a nightmare. In 2050, our tents will be the solution. They will be made from photovoltaic technology – think solar panels – that will capture the sun’s energy and convert it into power. Each tent will come with some form of a power pack which will allow you to plug in your phone. Glastonbury organiser Emily Eavis says this will also help with one of the biggest issues faced by the festival: rubbish. Eavis attributes this to our disposable attitude to personal belongings. However, in 2050 we won’t be so tempted to leave behind our battered tent as it will be too useful to us. Tickets, cash, ID and bank cards are all essential – and easy to lose. In 2050, The Future Laboratory predicts that festival-goers will use implants in their bodies and voice recognition to buy their pints of cider. Haptic technology is a textile-based invention that adds a sense of touch to virtual environments. In 2050, our T-shirts and jeans will be made from the stuff and, as a result, you’ll be able to feel the force and vibrations of the bassline and the swaying crowds. ‘The sensation will be textural, as in your clothing hugging and pressing against you – you’ll even be able to feel sensorial blasts related to the tone of the song.’ Perfect for those who want a moshpit experience without the neckache. This same technology will allow us to send emotions to each other. ‘In theory, one can send a virtual touch to another, which could be a hug or a kiss, depending on what type of haptic ‘suit’ the other person is wearing,’ says Savigar. Just like sending a kiss or a smiley face in a text, we’ll be able to do the same but it will be felt on our bodies. Similar technologies embedded in festival-goers’ clothing will also convey the band’s adrenalin during their set, making us far more part of the action. 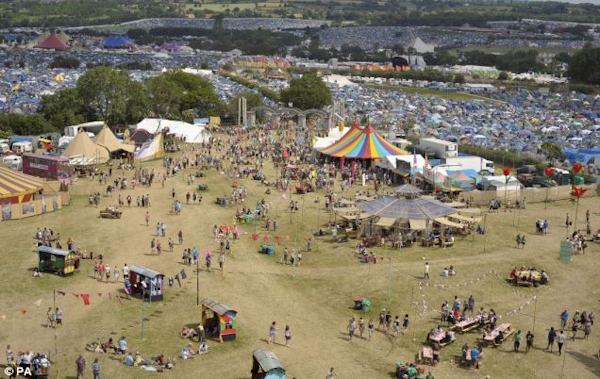 The Orange Chill ’*’ Charge area returns to Glastonbury with hundreds of phone chargers, laptops and unannounced acoustic performances from the likes of I Blame Coco and Paloma Faith. For all the latest updates, go to the Orange Glastonbury Blog at www.orange.co.uk/glastonbury.